The Meghalaya Pradesh Congress Committee (MPCC) came down heavily on the BJP-led NDA Government and called it a “Government that knows only to inaugurate projects” initiated by the UPA Government in four years of Narendra Modi as the Prime Minister. Addressing media persons at the Congress Bhawan here, Meghalaya Congress president Dr Celestine Lyngdoh said that in four years of the NDA Government since 2014, the people have been benefitted by nothing except sufferings. On the NDA Government’s claims that huge amount of money has been pumped in especially in the Northeast by the NDA Government, Dr Lyngdoh said that creation of jobs was not there and they came to the Northeast only to inaugurate projects already initiated by the Congress-led UPA Government. Referring to Dhola–Sadiya bridge, which has been named as Dr Bhupen Hazarika Setu over river Brahmaputra connecting Assam with Arunachal Pradesh, he said the Shillong bypass road as well as the Shillong-Nongstoiñ-Tura highway were also initiated by the UPA government. “We have not seen results in the ground. If we look at the Northeast, the industrial promotion policy, BRGF were done away with by the Centre after the BJP came to power. 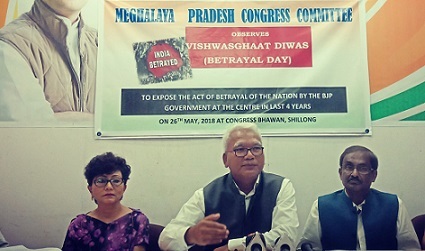 Therefore this is not the fourth anniversary of the NDA Government, but the fourth anniversary of betrayal, false hope and cheating of the people of the country,” Dr Lyngdoh said. Slammed the completion of four years of the Modi Government, Dr Lyngdoh recalled the sufferings of people during demonetization, increase of fuel prices and LPG, and alleged that atrocities on women, Dalits, Adivasis and others were an all-time high in four years of the NDA Government. He termed the NDA Government as “not a game changing government” but a government that changed the name of schemes and changed its slogans from one to another. On the BJP’s plan to end Congress rule in all States in the country, Dr Lyngdoh said that now the BJP now talked only about Congress-mukt, and later when they would achieve, they would also say regional parties-mukt. “The BJP wanted everyone to fall in line with whatever they dictate, but the Congress will continue to fight and would come back to power in 2019,” the Meghalaya Congress chief said. ?? ?